With a capacity of 350ml, this porcelain mug features a striking surface pattern, brand stamp and exposed glaze line. Inspired by Bert’s interpretation of the sweeping landscape of Dartmouth. 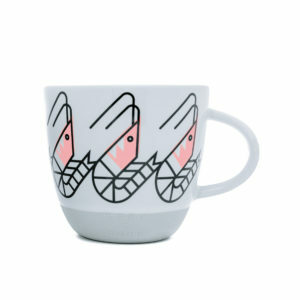 A member of the new Bert & Buoy ceramic family, this mug was created collaboratively by designer and illustrator, Bert Fowler, and renowned ceramicist, Keith Brymer Jones. Presented in a designer gift box with a gift tag, every mug is both microwave and dishwasher safe. Inspired by a life lived and loved on the coast, each illustration was originally sketched by Bert Fowler in his South Devon studio before being transferred onto a uniquely shaped and designed mug by master potter, Keith Brymer Jones. This mug represents the way the buildings of Dartmouth stack down enchanting down the hillside before they hit the iconic waterfront. Using Bert’s characteristic thick black lines with a slab of vibrant sea blue, you’ll spot something new every time you look at this design. Meticulously crafted from light-grey staining porcelain to mimic a beach pebble, the Dartmouth mug is striking enough as a solo piece and stunning in amongst the other Bert & Buoy mugs.